Portal vein leiomyosarcoma (LMS) is a very rare entity with poor prognosis. Only few cases have been reported in the literature. We report the case of a 53-year-old man with portal vein LMS presenting as a hilar tumor and causing cholestasis. The tumor measured 10 cm and was responsible for right portal vein thrombosis and compression of the biliary convergence. A right hepatectomy with hilar en bloc resection was performed with portal vein and biliary reconstruction. Pathology confirmed the complete resection of a well-differentiated leiomyosarcoma of the portal vein. The postoperative outcome was uneventful and the patient received no adjuvant treatment. Six months after the procedure, the patient is doing well with a normal quality of life and without any sign of recurrence. Aggressive and radical surgery should be proposed in first intention for the treatment of portal vein LMS. Leiomyosarcoma (LMS) is a soft tissue tumor arising from smooth muscle cells with significant metastatic potential and poor prognosis. Among LMS, those involving vascular structures represent only 2% of the cases and are mostly localized on the inferior vena cava. Indeed, vascular LMSs have only exceptionally been described in the minor vessels, and to date, only four cases of portal vein LMS have been reported. We present a case of LMS of the portal vein infiltrating the hepatic hilar structures, with compression of the biliary ducts and right portal vein thrombosis. 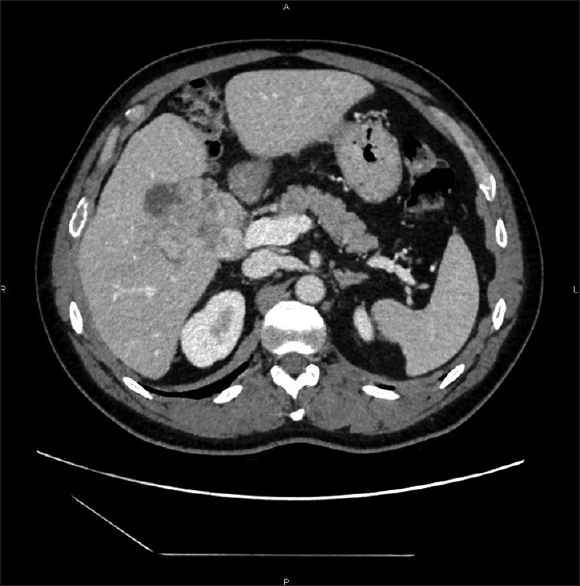 A 53-year-old man presented with cholestasis and abdominal pain. Imaging (CT scan and MRI) revealed a voluminous hilar mass of 10 cm with thrombosis of the right portal branch and an extension in segment five parenchymas. The right biliary duct and the right branch of the hepatic artery were in close contact by the tumor, but did not appear to be invaded [Figure 1]. The intrahepatic bile ducts were moderately dilated. The biological markers revealed moderate cholestasis (gamma-GT = 91 IU/L [reference, 11-55 IU/L ] and ALP = 84 IU/L [ reference, 40-130 IU/L ]) with normal liver enzymes level. Other biological parameters, including tumor markers (α-fetoprotein, CA 19-9, and CEA), were normal. Portal vein LMS was suspected on imaging findings, and in compliance with ESMO guidelines, fine-needle biopsies were performed which confirmed well-differentiated LMS. 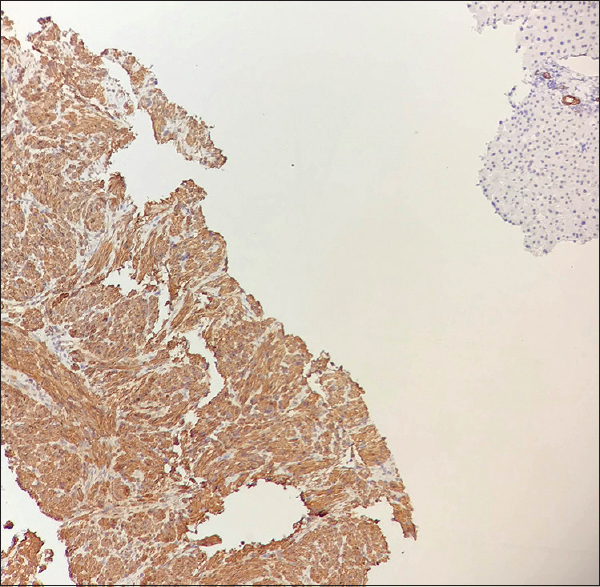 The α-smooth muscle actin, desmin, and heavy-caldesmon markers were immunohistochemically detected on samples, confirming the diagnosis of LMS. The Ki67 proliferation index was 40%. No distant metastasis was found. The patient was transferred to a tertiary reference center in sarcoma management and a multidisciplinary team including an oncologist, radiologist, pathologist, and specialized surgeon performed initial surgical treatment without neoadjuvant treatment. Surgery was performed with a J-shape subcostal laparotomy and consisted of a right hepatectomy with hilar en bloc resection (i.e., resection of the portal vein division and the biliary convergence). The hepatic artery division was not affected by the tumor and the right hepatic artery could be resected at a safe distance from the tumor [Figure 2]. Reconstruction of the portal vein was performed with an end-to-end anastomosis between the left branch and the main trunk of the portal vein, whereas biliary reconstruction was performed with an end-to-end, duct-to-duct anastomosis with T-tube insertion. The postoperative course was uneventful. Doppler ultrasound confirmed regular flow in the portal vein. The T-tube was clamped on postoperative day (POD) 7 and the patient was discharged from the hospital on POD 8. Pathology confirmed the presence of LMS (heavy-caldesmon staining positive on tumoral cells) developed from the portal vein [Figure 3]. Based on the FNCLCC score, the lesion was classified as a well-differentiated LMS, grade II owing to 15% necrotic area and the mitotic activity of 16 mitoses in 10 high-power fields. Complete resection (R0) was achieved. After a multidisciplinary committee discussed the case, no adjuvant chemotherapy was performed. Six months after the procedure, the patient is still doing well with a normal quality of life and with no signs of recurrence. Leiomyosarcoma is a very aggressive mesenchymal tumor with poor prognosis, especially regarding the vascular subtype., Owing to the frequent asymptomatic nature and their metastatic potential, vascular LMSs are usually diagnosed in an advanced stage resulting in a low resection rate. Among vascular LMSs, portal vein LMSs are very rare and only four cases have been described in the literature. The first portal vein LMS was described by Wilson et al. in 1987. The lesion was incidentally discovered in a 28-year-old woman, but owing to tumor extension, the patient could not be resected or transplanted. In 1990, Sundaresan et al. reported the case of a vascular LMS arising from the hepatic pedicle. The portal vein origin was supposed but not confirmed since this 30-cm lesion also invaded adjacent structures. More recently, our team reported the case of a 44-year-old woman with portal vein LMS localized in the retro-pancreatic portion. A pancreaticoduodenectomy was performed with portal vein resection up to the right and left divisions and the portal vein reconstruction used a vascular (Gore-Tex®) prosthesis. Twenty-seven months after the procedure, the patient presented local recurrence, which was considered unresectable. In 2016, Gohrbandtet al. reported a hilar LMS in a 71-year-old woman treated by right hepatectomy associated with resection of the biliary convergence with end-to-side hepaticojejunostomy reconstruction. Despite complete resection, local recurrence was detected 36 months after the procedure. Owing to its very low incidence, no recommendations are available for the management of portal vein LMS. Indeed, there are no data supporting the interest of neoadjuvant or adjuvant chemo/radiotherapy. Radical surgical resection would, therefore, appear to be the only potential curative treatment and should not be delayed by any medical treatment. However, the two patients who were resected presented with local recurrence 2 years and almost 3 years after the procedure, despite complete R0 resection., These poor oncologic outcomes should not question the importance of possible surgical resection, especially in case of symptomatic tumors, over medical treatment which should be considered only for unresectable patients. Interestingly, recurrence was only reported in the remaining liver in the two cases without distant metastases. One can, therefore, discuss the potential interest of liver transplantation as a possible curative treatment for portal vein LMS. In any case, despite limited follow-up, surgical treatment provided complete R0 resection and a normal quality of life for our patient. Leiomyosarcoma of the portal vein is a very rare disease, which must be managed in a reference center specialized in sarcoma and hepatobiliary surgery. When possible, aggressive and radical surgery must be considered to achieve the best survival outcome. George S, Serrano C, Hensley ML, Ray-coquard i. soft tissue and uterine leiomyosarcoma. J Clin Oncol 2018;36:144-50. Alkhalili E, Greenbaum A, Langsfeld M, Marek J, Rana MA, Glew R, et al. Leiomyosarcoma of the inferior vena cava: A case series and review of the literature. Ann Vasc Surg 2016;33:245-51. Wilson SR, Hine AL. Leiomyosarcoma of the portal vein. Am J Roentgenol 1987;149:183-4. ESMO/European Sarcoma Network Working Group. Soft tissue and visceral sarcomas: ESMO clinical practice guidelines for diagnosis, treatment and follow-up. Ann Oncol 2014;25(Suppl 3):iii102-12. Neuhaus P, Thelen A, Jonas S, Puhl G, Denecke T, Veltzke-Schlieker W, et al. Oncological superiority of hilar en bloc resection for the treatment of hilar cholangiocarcinoma. Ann Surg Oncol 2012;19:1602-8. Svarvar C, Böhling T, Berlin O, Gustafson P, Follerås G, Bjerkehagen B, et al. Clinical course of nonvisceral soft tissue leiomyosarcoma in 225 patients from the Scandinavian Sarcoma Group. Cancer 2007;109:282-91. Miyajima K, Oda Y, Oshiro Y, Tamiya S, Kinukawa N, Masuda K, et al. Clinicopathological prognostic factors in soft tissue leiomyosarcoma: A multivariate analysis. Histopathology 2002;40:353-9. Sundaresan M, Kelly SB, Benjamin IS, Akosa AB. Primary hepatic vascular leiomyosarcoma of probable portal vein origin. J Clin Pathol 1990;43:1036. Boudjema K, Sulpice L, Levi Sandri GB, Meunier B. Portal vein leiomyosarcoma, an unusual cause of jaundice. Dig Liver Dis 2014;46:1053-4. Gohrbandt AE, Hansen T, Ell C, Heinrich SS, Lang H. Portal vein leiomyosarcoma: A case report and review of the literature. BMC Surg 2016;16:60.